The blue and white bracelet sat on our dining room table. Sometimes it made me smile, and other times it made me nervous. A visual reminder given for our friend, Sarah serving overseas, the bracelet would stop me in the middle of my normal–and remind me to give thanks and say a prayer. Sarah’s deployment this year was for 133 days. 133 days away from her kiddos. It was easier for me to blow by Veterans Day when veterans were old white guys who came and spoke at our school assembly. Don’t get me wrong, I’m thankful to those old white guys–including both of my grandpas–but Veteran’s Day feels different this year as I realize more that veterans come from all walks of life, including my own. No, I can’t run marathons like Sarah, but in many ways our lives are the same. As I lived 133 days with my young family eating normal suppers, doing my normal laundry, and going to my normal job, Sarah’s family lived 133 days of giving. Sacrifice is costly, and as Americans we all live in a debt vacuum; like fish, we don’t realize the water we’re swimmin’ in. Simply say thank you. No bells and whistles here, just identify a veteran with whom you have regular contact and stop to say thanks. Also, thank the family members. When you thank the family, you thank the veteran as well. Take a veteran out to eat or, if you bake, make a dessert or another treat to take to a neighbor-veteran. Send an e-card though the American Legion. Visit a local nursing home or VA hospital. Whenever you see a veterans group selling poppy flowers, purchase and wear one. Proceeds often go to disabled, needy, and aging veterans in VA hospitals. Pick up the phone. Take the time to call a grandparent, uncle, aunt, mother or father who has served–especially if they live far away. Just call to say hi and see how they are doing. Have your child draw a picture or send a letter to mail to a veteran. If you live near an elderly veteran, give them your phone number and offer to help around the house especially during these upcoming winter months. Participate in the “Thank a Veteran at Work” program from the History Channel. Going on a flight? Donate your airline miles to the Hero Miles program. 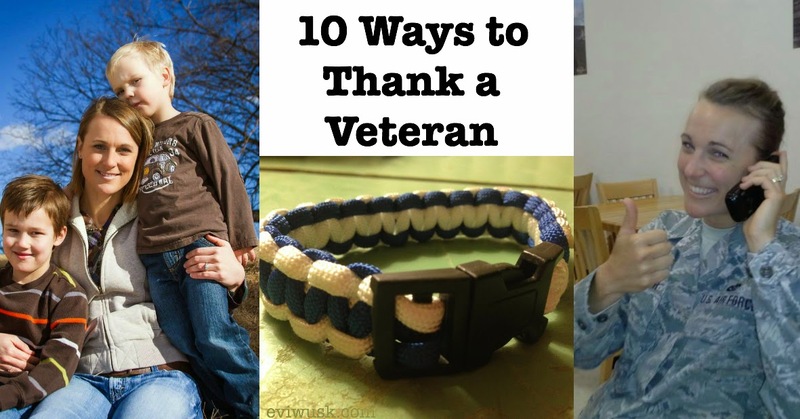 Choose one of these ways and thank a veteran, and/or find a way to “serve” in your own life.